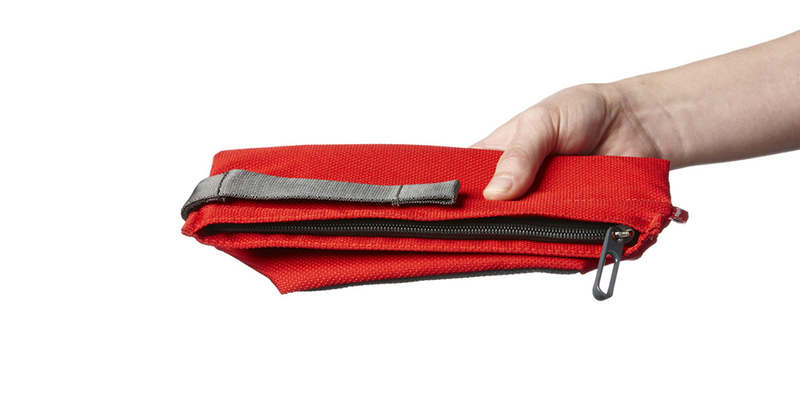 Say goodbye to shapeless packing cubes and floppy travel organizers! The GoTote is designed around a lightweight internal frame that holds the bag open and materials that help keep it upright, so it's simple to pack and unpack. Three sizes offer maximum versatility--the small size is perfect for a few toiletries, while the large size will easily hold a tablet and a bulky pair of headphones. The civilized tote that stands up and stays open. No matter what you're toting, the GoTotes light-colored interior fabric makes it easy to see inside, and the soft face prevents contents from snagging. Generous interior pockets keep contents separate and organized, and the top zip makes sure nothing falls out en route. For extra convenience, the strap easily converts to a hang loop for hands-free access. GoTotes are intentionally simple and intuitive--like our other products. The focus was on making it easier for you to fill them and then access the contents when needed. And we made them in a civilized color scheme so they could be at home on the trail, at the hotel, or around town. GoTotes are made with a very durable water- and wear-resistant outer fabric and are backed by humangear's lifetime warranty. Why did humangear come out with a bag? Over the years, we've come out with a number of products that make being on-the-go easier, so it's only natural that we'd eventually consider an innovative way for you to tote all these different on-the-go products around. The GoTote is our design solution for carrying, storing, and accessing all the humangear products you've acquired. We've also designed GoTotes to be useful for all sorts of other toting needs. Where would you find a GoTote? In a suitcase toting toiletries (your shampoo in a GoToob and your floss in a GoTubb, of course!). In a pannier toting bike repair tools, a mini-pump, and an extra pair of gloves, since it's cold outside. In a backpack toting a fuel canister, backpacking stove, and some freeze-dried meals--you remembered the GoBites too, right? In a guitar case toting extra picks, ear plugs, and a flask of something for after the gig. In a gym bag toting deodorant, make-up, and hair ties--the good kind that used to get lost in your purse. Yes! GoTotes are made with water-resistant fabric, but they are not watertight or submersible. The strap allows you to create a hang loop with one easy snap. Now you can temporarily hang your GoTote from a hook in a hotel bathroom or from just about anything when you need hands-free access. At humangear, CRTM is an acronym for Coffee Road Trip Meeting. How does the GoTote stay open? The GoTote has a lightweight flex-frame sewn into the opening, enabling the GoTote to stay upright and open.